The starting point for an efficient workflow, the AXS-R5 recorder uses AXSM memory cards, which are compatible with the AXS-CR1 USB 3.0 reader (cards and reader are sold separately). Once on a PC, the RAW files can be screened using Sony's free RAW Viewer software. Sony 16-bit linear RAW is also the ideal point of entry into the 16-bit linear Academy Color Encoding System (ACES) workflow. Sony's 16-bit precision captures more tonal values than the human eye can differentiate, preserving every detail from every pixel for full exploitation in post-production. The AXS-R5 recorder allows the PMW-F55 and PMW-F5 to capture native 4K or derived 2K. RAW recording preserves the greatest latitude for color correction and other post processes. Sony RAW retains 16 times as many Red, Green and Blue gradations as 12-bit RAW and 64 times as many tones per channel as 10-bit recording. The AXS-R5 provides for a coordinated "off-line/on-line" workflow with simultaneous recording for the F55 and F5 cameras to internal SxS cards and the AXS-R5 RAW recorder. Users get matching timecode, start frame, stop frame, file names and other metadata for seamless conforming in post. The AXS-R5 allows you to record up to 240 fps 2K RAW with the F55 and F5, per necessary firmware updates installed on the cameras. Sony understands that working cameras require practical workflows. That's why the AXS-R5 is part of a larger production platform that includes affordable media cards, affordable card readers, free RAW Viewer software and compatibility with popular NLEs and finishing tools. The AXS-R5 is designed to "bolt-on" seamlessly to the F55 and F5 cameras, allowing the cameras to maintain a sleek, lightweight and ergonomic design. Both recorder and camera chassis are only slightly wider than a typical PL-mount prime lens, perfect for 3D rigs. 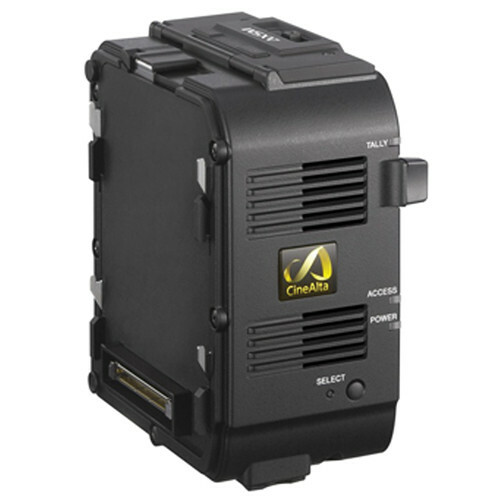 Box Dimensions (LxWxH) 7.7 x 7.0 x 6.0"
AXS-R5 Recorder is rated 4.0 out of 5 by 1. Rated 4 out of 5 by Heck from Gimmie 4k The bolt on design is pretty handy for the cameras in can attached to along with the HXR-IFR5. Straight forward use. Would love for the 4k recording at 240fps to be longer than 4sec but I'll take those 4 instead of the other options out there for my FS700. What memory card does this unit take ? SxS or SSD? The Sony AXS-R5 Recorder records to SxS cards. Is this compatible with the FS5? The AXS-R5 was the first (and only totally &ldquo;official&rdquo;) way to record 4K raw from the FS-700R. It&rsquo;s also Sony&rsquo;s &ldquo;certified&rdquo; way to record 4K raw from the FS7. The comment below should say that the F5/55 are the only cameras that this recorder physically attaches to, piggyback style... well, it attaches to the Venice camera directly also. Do I also have to purchase the HXR-IFR5 interface, or will this work if I have SxS media? We are not quite sure of your question. We can say that the Sony AXS-R5 Recorder uses SxS media for HD and AXSM media for 4K. The HXR-IFR5 will make no difference in this. The HXR-IFR5's purpose is to allow you to use the AXS-R5 with the Sony FS700. Do you have a complete list of frame rates and sizes (e.g. 4096 x 2160, 1920 x 1080, etc.) and what the data rate is for them? No one seems to have anything other than 60 fps/240 fps. Like to have 24 fps data rates for various formats. Thanks. I have this product but I really don't care about data rates since I am not doing any live or broadcast streaming/editing with my footage. That is probably a question you may need to reach out to Sony. Or when I was doing my research on this hardware, these guys had some pretty good info on the setup (I have the FS700)Magnanimous Media, I couldn't paste the link to their website here but they maybe able to assist with your question. They have some really good tutorials and setup instructions operating cameras.You may want to reach out to them and see if they can assist you.